Posted on November 16, 2018 at 3:30 pm. Electronic cigarettes (e-cigarettes) are battery-powered devices that provide nicotine and other additives to the user in the form of an aerosol (1). E-cigarettes entered the U.S. marketplace in 2007 (1), and by 2014, e-cigarettes were the most commonly used tobacco product among U.S. youths (2). Data from the 2011–2018 National Youth Tobacco Survey (NYTS), a cross-sectional, voluntary, school-based, self-administered, pencil-and-paper survey of U.S. middle and high school students, were analyzed to determine the prevalence of current use (≥1 day in past 30 days) of e-cigarettes,* current use of any tobacco product,† frequency of (number of days during the preceding 30 days) e-cigarette use, and current use (any time during preceding 30 days) of any flavored e-cigarettes among U.S. middle school (grades 6–8) and high school (grades 9–12) students. Logistic regression (2011–2018) and t-tests (2017–2018) were performed to determine statistically significant differences (p<0.05). Among high school students, current e-cigarette use increased from 1.5% (220,000 students) in 2011 to 20.8% (3.05 million students) in 2018 (p<0.001) (Figure). During 2017–2018, current e-cigarette use increased by 78% (from 11.7% to 20.8%, p<0.001). The proportion of current e-cigarette users who reported use on ≥20 of the past 30 days increased from 20.0% in 2017 to 27.7% in 2018 (p = 0.008). Among high school students, during 2017–2018, current use of any flavored e-cigarettes increased among current e-cigarette users (from 60.9% to 67.8%, p = 0.02); current use of menthol- or mint-flavored e-cigarettes increased among all current e-cigarette users (from 42.3% to 51.2%, p = 0.04) and current exclusive e-cigarette users (from 21.4% to 38.1%, p = 0.002). 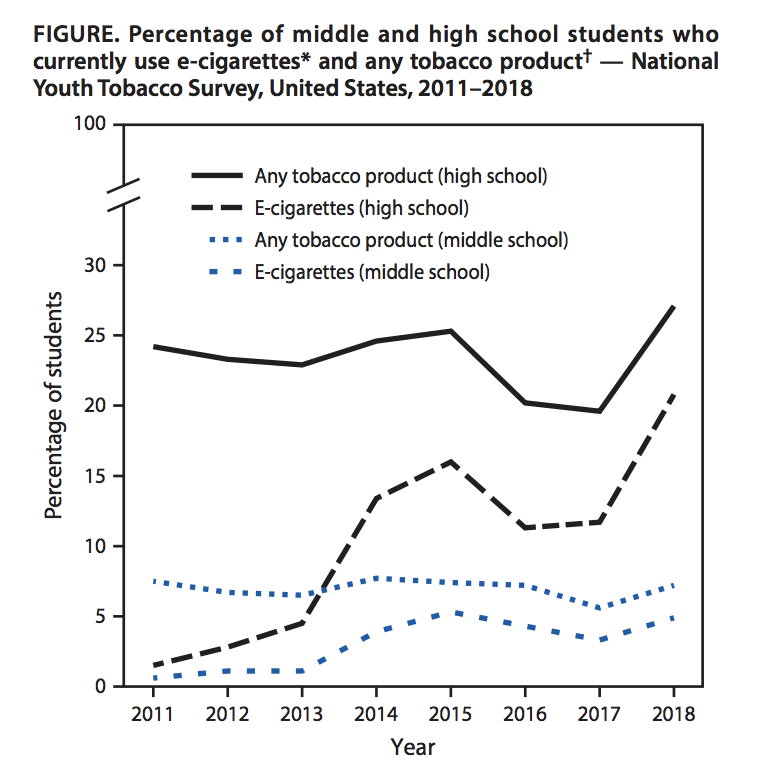 Among middle school students, current e-cigarette use increased from 0.6% in 2011 (60,000 students) to 4.9% (570,000 students) in 2018 (p<0.001) (Figure). During 2017–2018, current e-cigarette use increased by 48% (from 3.3% to 4.9%, p = 0.001); the proportion of current e-cigarette users who reported use on ≥20 days of the past 30 days did not significantly change (from 12.9% to 16.2%, p = 0.26). Current use of any tobacco product among high school students was 24.2% (3.69 million students) in 2011 and 27.1% (4.04 million students) in 2018 (p>0.05) (Figure). Current use of any tobacco product among middle school students was 7.5% (870,000 students) in 2011 and 7.2% (840,000 students) in 2018 (p>0.05). During 2017–2018, overall tobacco product use increased by 38% among high school students (from 19.6% to 27.1%, p<0.001) and by 29% among middle school students (from 5.6% to 7.2%, p = 0.008). Current e-cigarette use increased considerably among U.S. middle and high school students during 2017–2018, reversing a decline observed in recent years and increasing overall tobacco product use (3). Moreover, during 2017–2018, frequent e-cigarette use increased among high school students. Although e-cigarettes have the potential to benefit adult smokers if used as a complete substitute for combustible tobacco smoking, the use of any form of tobacco product among youths, including e-cigarettes, is unsafe (1). The Surgeon General has concluded that e-cigarette use among youths and young adults is of public health concern; exposure to nicotine during adolescence can cause addiction and can harm the developing adolescent brain (1). The rise in e-cigarette use during 2017–2018 is likely because of the recent popularity of e-cigarettes shaped like a USB flash drive, such as JUUL; these products can be used discreetly, have a high nicotine content, and come in flavors that appeal to youths (4). In September 2018, the Food and Drug Administration (FDA) issued more than 1,300 warning letters and civil money penalty fines to retailers who illegally sold e-cigarette products to minors, the majority of which were blu, JUUL, Logic, MarkTen XL, and Vuse; this was the largest coordinated enforcement effort in FDA’s history (5). Sustained implementation of proven population-based strategies, in coordination with the regulation of tobacco products by FDA, is key to reducing all forms of tobacco product use and initiation, including e-cigarettes, among U.S. youths (1).